I like retro additions to the kitchen – and these Headlight Scales are something a little different from other scales on the market. They’re so called because they have been likened to the headlights of a 1950s car, making them ideal for anyone who wants to create a 50s diner look in their kitchen. Available in a range of colours, they’re also reasonably priced at only £29. Find out more at Store – A Place for Everything.co.uk. The 1950’s retro kitchen stuff is very in at the moment. 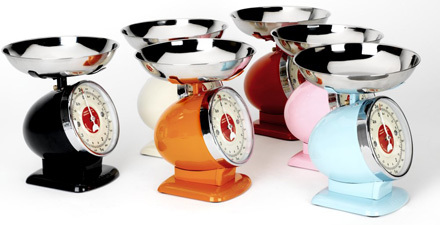 There are lots of items out there now that will match these great looking kitchen scales like the Dualit toasters.